When there’s good food involved, we like to think everyone’s winning. And this year at the Careers through Culinary Arts Program (C-CAP) Culinary Competition, young chefs Adrian Gonzalez and Matthew Sanchez won big! Adrian snagged a $2,700 Culinary Classroom scholarship, and C-CAP gifted Matthew with a $2,700 scholarship. Matthew will be taking the Master Baking Program. 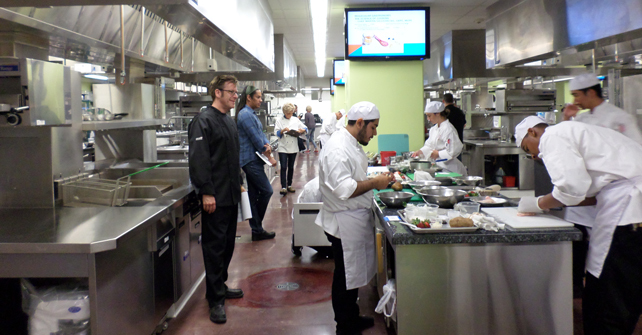 Since 1990, C-CAP has provided more than $50 million in scholarships to talented high school students seeking to enter the competitive culinary field, with rewards varying from a $250,000 four-year Johnson & Wales scholarship to three months’ restaurant work in Europe – and Chef Eric has been a proud contributor for over 10 years. Not only does he take time to judge the finals, he rarely misses the awards breakfast…and not just because he loves breakfast. We want to make our awesome programs accessible even if you didn’t kill it in a competition. We offer payment plans and part-time options so nothing can keep you from going pro or cooking and baking like one! Get a load of graduates’ success stories, get inspired, and get ready for our next Master Chef and Baking Programs starting on September 10th and September 12th.